A sniper in the Canadian special forces has broken a British-held record for the longest confirmed kill after shooting dead an IS fighter from more than two miles away. The bullet was fired from a high-rise building with a McMillan TAC-50 sniper rifle in Iraq, a military source told Toronto's Globe and Mail newspaper. It took less than 10 seconds to travel 3,540 metres (2.19 miles) - approximately the distance between Big Ben and the Tower of London. "The shot in question actually disrupted a Daesh (Islamic State) attack on Iraqi security forces," the source said. "Instead of dropping a bomb that could potentially kill civilians in the area, it is a very precise application of force and because it was so far way, the bad guys didn't have a clue what was happening." 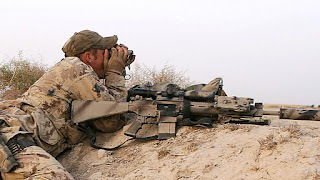 The previous record for longest confirmed kill was set by British Army sniper Craig Harrison, who shot two militants in Helmand Province, Afghanistan, from 2,475 metres (1.53 miles). The Canadian Special Operations Command confirmed that a member of its Joint Task Force 2 "successfully hit a target", but refused to say when the shot was fired. It said: "For operational security reasons and to preserve the safety of our personnel and our Coalition partners we will not discuss precise details on when and how this incident took place." The shot was independently verified by camera and required the sniper to take wind, ballistics and the curvature of the Earth into account. Canadian major general Michael Rouleau described the kill as "unprecedented". "In this case, there was a digital record from another observation post, actually unknown to the sniper in question," he told the Globe and Mail. "I have reviewed it and it has been reviewed by some of our allies as well. This is an irrefutable act." He added: "There is an element of art involved where the sniper actually has to estimate where the Daesh fighter is going to be, because when he pulls the trigger, there is just under 10 seconds of time of flight for the round. "There is a lot of science involved in terms of the ballistic calculations but there is a subjective element of assessing what the winds are doing and whatnot."